Rain showers on Monday, Jan. 23 didn’t dampen the spirits of the students of St. Bede School in Holland, who for the third year held their own March for Life. Much like the March for Life held in Washington, D.C. on the same day, the children protested in a prayerful way the Supreme Court’s decision that permits unborn children to be aborted. 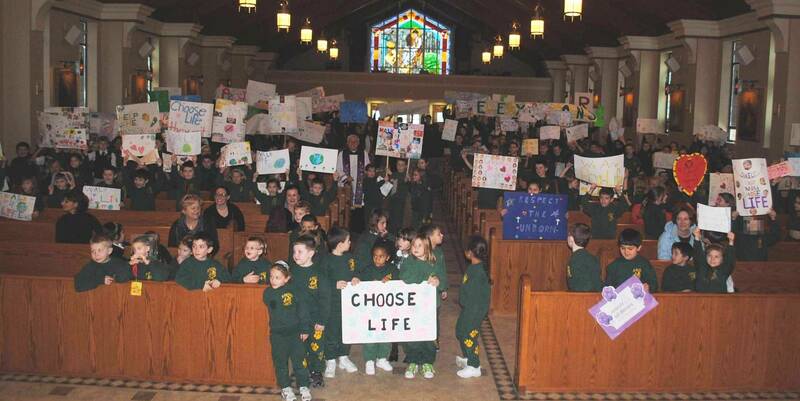 While this year’s event was cut short due to the weather, the students and several parishioners marched from the school gymnasium to the church, carrying colorful signs defending all life. “The important thing is our prayers,” said St. Bede pastor Msgr. John C. Marine, who led the children in prayers to the Blessed Mother and St. Francis of Assisi.